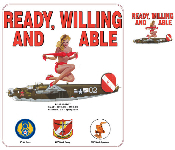 B-24 Ready, Willing and Able - 8th Air Force, 467th Bomb Group, 790th Bomb Squadron. Small crest on front, large design on back. One-sided design has large image on front, nothing on the back. Available as a T-shirt or a Sweatshirt. Comes in White or Natural.